Megohm bridge is another important method for measurement of high resistances. It has one three terminal high resistance located in one arm of the bridge. 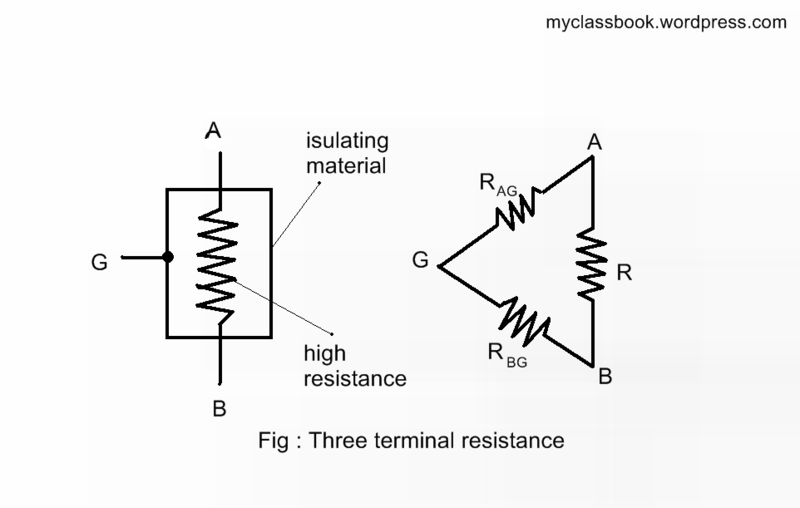 Fig a) shows the very high resistance with terminals A and B, and a guard terminal, which is put on the insulation. So it forms a three terminal resistance. Let us consider take the hypothetical case of a 100 Mohm resistance .let we assume that this resistance is measured by an ordinary Wheatstone bridge. It is clear that Wheatstone will measure a resistance of 100*200/(100+200)=67Mohm instead of 100Mohm thus the error is 33 percent. 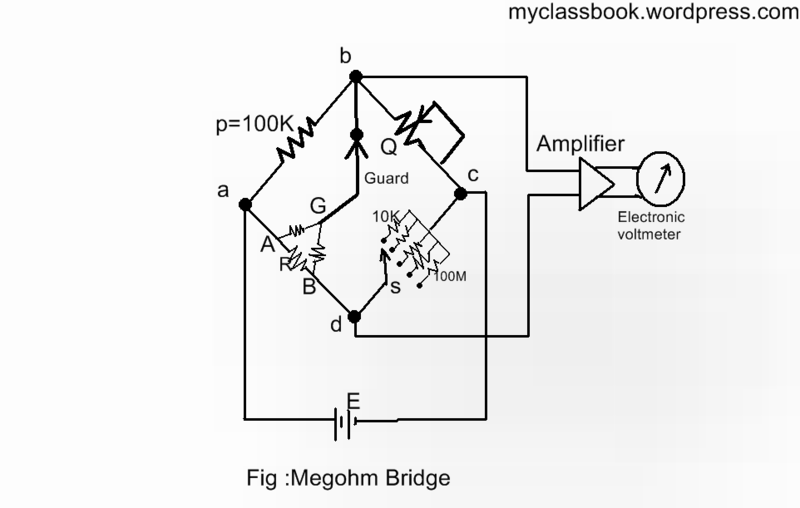 However, if the same resistance is measured by a modified Wheatstone bridge as shown in fig b)with the guard connection G connected as indicated, the error in measurement will be reduced and this modified Wheatstone bridge is called megohm bridge. The arrangement of above figure illustrated the operation of Megohm Bridge. The figure shows the circuit of the completely self-contained Megohm Bridge which includes power supplies, bridge members, amplifiers, and indicating instrument. It has ranged from 0.1MO to 10^6MO. The accuracy is within 3% for the lower part of the range to possible 10% above 10000MO. The sensitivity of balancing against high resistance is obtained by use of adjustable high voltage supplies of 500V or 1000V and the use of a sensitive null indicating arrangements such as a high gain amplifier with an electronic voltmeter or a C.R.O. The dial on Q is calibrated 1-10-100-1000 MO, with main decade 1-10 occupying greater part of the dial space. Since unknown resistance R=PS/Q, the arm Q is made, tapered, so that the dial calibration is approximately logarithmic in the main decade, 1-10. Arm S give five multipliers, 0.1,1,10,100 and 1000. The junction of ratio arms P and Q is brought on the main panel and is designated as ‘Guard’ terminal.